1670s: disciple of the Kyôto dance master Ebisuya Kichibei, he starts his career performing under the name of Takenaka Ukon. Later, he becomes wakaonnagata and performs under the name of Takenaka Hatsudayû. His next stage names are Takenaka Hatsunojô, then Takenaka Hatsusaburô I. 1686: he becomes tachiyaku and takes the name of Takenaka Tôzaburô in Kyôto. 1690: he settles in Ôsaka. 11th lunar month of 1699: Tôzaburô plays in Ôsaka the role of Tatsuta Naniwanosuke in the drama "Daimyô Takara no Fukubiki", which is produced by Takeshima Kôjûrô. 3rd lunar month of 1702: Tôzaburô's rank in the Ôsaka hyôbanki, tachiyaku section, is jô (superior). 1703: Tôzaburô performs in Kyôto. 1705: Tôzaburô goes back to Ôsaka. 11th lunar month of 1707: Tôzaburô plays in Ôsaka the role of Adachi Tômanosuke in the kaomise drama "Manpô Chibako no Tama", which is produced by Kataoka Nizaemon I. 1st lunar month of 1708: Tôzaburô plays in Ôsaka the role of Nakamitsu in the new year drama "Minamoto no Manjû Okina Muko", which is produced by Kataoka Nizaemon I. 11th lunar month of 1709: Tôzaburô plays the role of Tokiwanojô in the kaomise drama "Onna Gosho Bunko", which is produced in Ôsaka by Shinozuka Shômatsu. Fall 1710: Tôzaburô goes to Kyôto. 11th lunar month of 1710: Tôzaburô plays in Kyôto at Kameya Kumenojô's theater the role of Takuemon in the kaomise drama "Kenkon Daikoku Bashira", which is produced by Kataoka Sanpei. 3rd lunar month of 1711: Tôzaburô's rank in the Kyôto hyôbanki, tachiyaku section, is jô-jô (superior - superior). He shares the same rank as Yamatoyama Jinzaemon I and Takeshima Kôjûrô. Fall 1711: Tôzaburô goes back to Ôsaka. 11th lunar month of 1711: Tôzaburô plays in Ôsaka the role of Uesugi Chûzaemon in the kaomise drama "Maizuru Yomeiri Kagami", which is produced by Shinozuka Shômatsu I. 3rd lunar month of 1712: Tôzaburô's rank in the Ôsaka hyôbanki, tachiyaku section, is jô-jô (superior - superior). He shares the same rank as Sakurayama Shirosaburô I, Sakurayama Shôzaemon I and Yamamura Kazaemon. 11th lunar month of 1712: Tôzaburô plays in Ôsaka the role of Dôjôji Shinbê in the kaomise drama "Onna Imagawa Seishi no Jôjô", which is produced by Shinozuka Shômatsu I. 1st lunar month of 1713: Tôzaburô plays in Ôsaka the role of the toneri Goômaru in the new year drama "Keizu no Musume". 11th lunar month of 1713: Tôzaburô performs in Ôsaka in the kaomise drama "Onna Fude Yôbunshô", which is produced by Arashi San'emon III and Ogino Yaegiri I. 11th lunar month of 1714: Tôzaburô performs in Ôsaka in the kaomise drama "Bandai-ga-Ike no Tsurukame", which is produced by Arashi Sanjûrô I at Shioya Kuroemon's theater. 11th lunar month of 1715: Tôzaburô plays in Ôsaka the role of the karô Kumabara Jûzaemon in Kaneko Kichizaemon's kaomise drama "Hachiman Chôja no Oto Musume", which is produced by Arashi San'emon III. 1st lunar month of 1716: Tôzaburô's rank in the Ôsaka hyôbanki, tachiyaku section, is jô-jô-(shiro)kichi (superior - superior - (white) excellent). He shares the same rank with Kaneko Kichizaemon and Onogawa Ugenji. 11th lunar month of 1716: Tôzaburô plays in Ôsaka at the Higashi no Shibai the role of Iwato Tatewaki in the kaomise drama "Futahashira Kasen Kagami". He also plays the role of Kanki in Chikamatsu Monzaemon's masterpiece "Kokusen'ya Gassen"; the role of Watônai is played by Sakurayama Shirosaburô I. 1st lunar month of 1717: Tôzaburô's rank in the Ôsaka hyôbanki, tachiyaku section, is jô-jô-(hanshiro)kichi (superior - superior - almost excellent). He shares the same rank with Miyazaki Denkichi. 11th lunar month of 1717: Tôzaburô plays in Ôsaka at the Higashi no Shibai the role of Nagaoka Chikaranosuke in the kaomise drama "Meryû Oryû Kogane no Uroko", which is produced by Arashi San'emon III. 11th lunar month of 1718: Tôzaburô performs in Ôsaka at the Higashi no Shibai in the kaomise drama "Kogane no Seigaiha", which is produced by Arashi San'emon III. 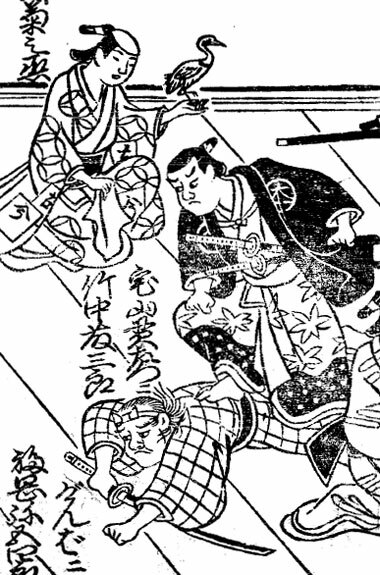 1st lunar month of 1719: Tôzaburô's rank in the Ôsaka hyôbanki, tachiyaku section, falls to jô-jô-(shiro)kichi (superior - superior - (white) excellent). First Kabuki adaptation of Chikamatsu Monzaemon's 1708 puppet theater drama "Keisei Hangonkô" by Kyôya Yagoshirô, which was produced by Arashi San'emon III in Ôsaka at the Kado no Shibai; Tôzaburô plays the role of Tosa Shôgen Mitsunobu [casting]. This is his last recorded performance in ôshibai. We don't know what happens to him afterwards for he disappears from the records. Takenaka Tôzaburô was a popular and talented Kamigata tachiyaku actor, who was active from the first half of the 1670s to the end of the 1710s. He excelled in budôgoto. He disappeared before reaching the prestigious jô-jô-kichi rank but he was very close to this level.